The stress of competition or even less stress can trigger eating disorders (energy intake imbalance), depression and other emotional disturbances. These need to be recognized, referred and treated as rapidly as possible. Sports psychologists and teams that are prepared to handle all of the ramifications of these issues are critical. 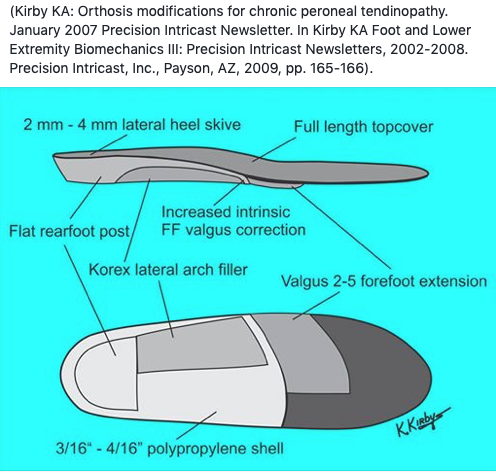 Kevin Kirby, DPM has posted a biomechanical description of the orthotic modifications he uses when treating chronic peroneal tendinopathy. They mesh well with what we’ve presented here and Kevin provides an excellent diagram along with his description. Be sure to read his post. While ankle sprains are the most common musculoskeletal athletic injury,(1) the peroneal tendon complex (PTC) is often injured concurrently. 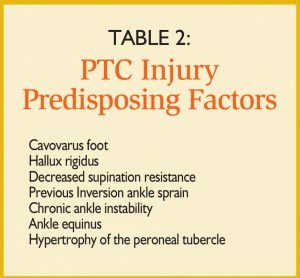 Injury to the PTC has become widely recognized as an acute injury and a significant source of lingering pain and disability. 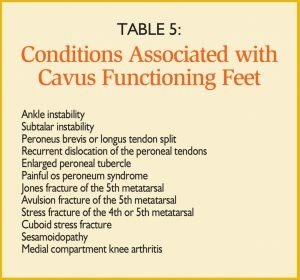 These injuries are frequently correlated with inversion ankle sprains and chronic ankle instability (CAI). The peroneal tendon complex (PTC) includes the peroneus longus and brevis tendons, the os peroneum, and their restraining components (Figure 1). We will discuss the anatomy, clinical significance and conservative treatment of injury to the PTC. The peroneus longus and brevis muscles are located within the lateral compartment of the leg. The vascular supply is primarily from the posterior peroneal artery. 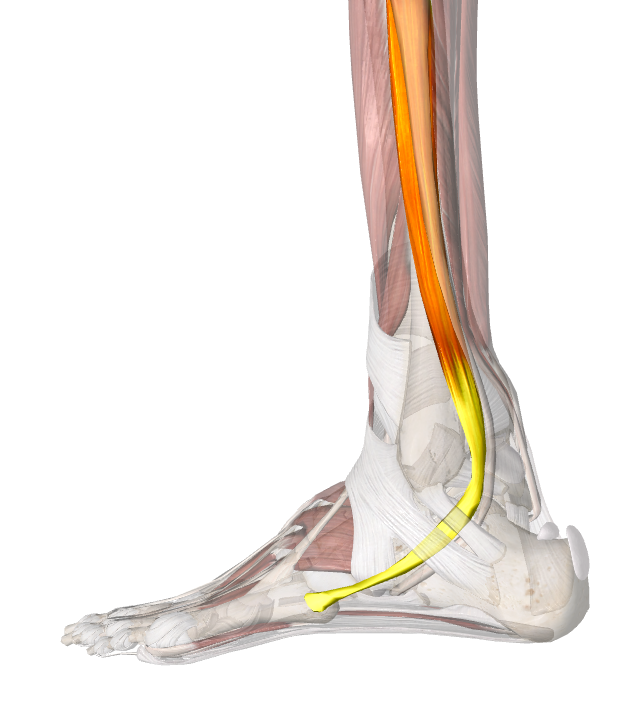 Innervation of the peroneals is from the superficial peroneal nerve. The well positioned constraints which serve to maintain proper anatomical position of the PTC include the superior peroneal retinaculum, the retromalleolar groove, the shared tendon sheath, the individual tendon sheaths, the peroneal tubercle, the inferior peroneal retinaculum, and the peroneal groove below the cuboid (Table 1). An ossified os peroneum is found in approximately 20% of individuals at the cuboid notch (Figure 2).(3). The tendon runs below the cuboid and crosses obliquely to insert into the base of the first and second metatarsal and the lateral facet of the medial cuneiform bone. Peroneal tendon injures are a direct result of their anatomy and biomechanics. 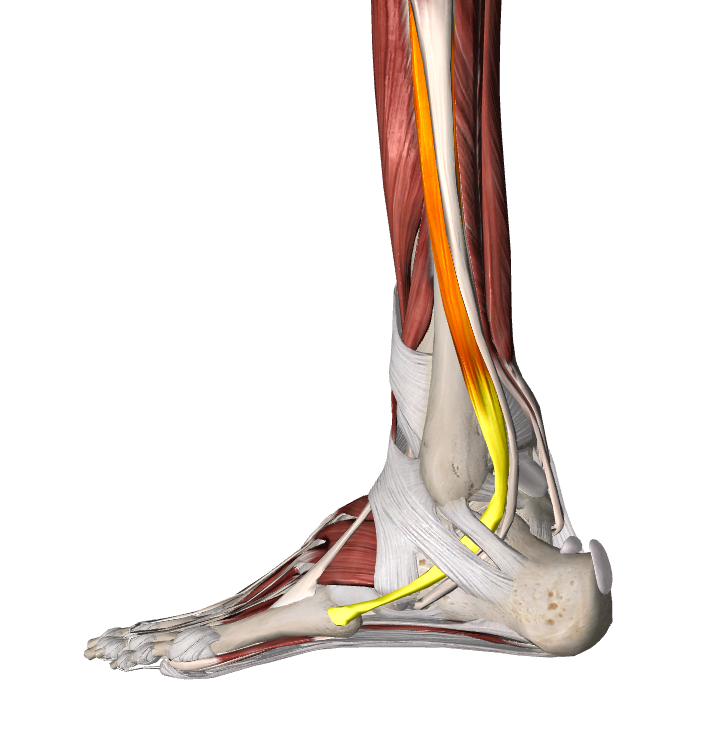 (5) The peroneal muscles are multi-joint muscles. Early in stance, the PTC is subject to passive stretch as the gastrosoleus acts proximally as a tibial decelerator. 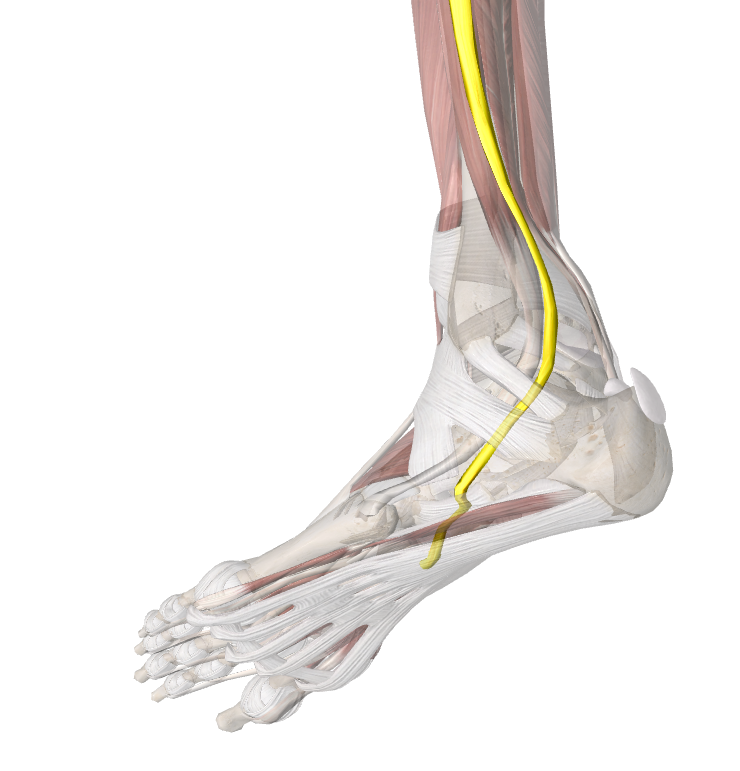 Late in stance phase, the PTC acts as a weak plantar flexor at the ankle joint. 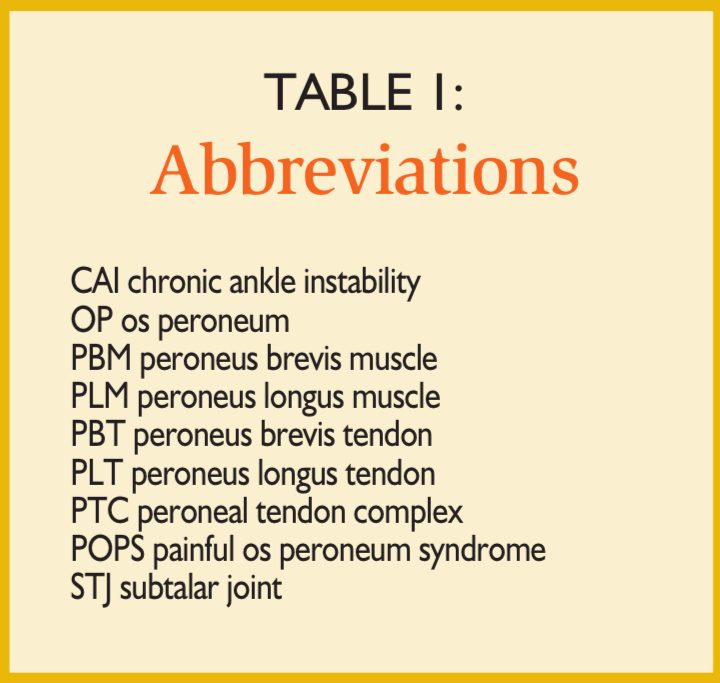 Risk factors associated with peroneal tendon injuries may be seen in Table 2. (11, 12) Multi-directional sports, such as soccer, tennis, and basketball, are associated with these injuries. While peroneus brevis injuries are frequently suspected at the level of the lateral malleolus, injury to the distal peroneus longus is often undetected. 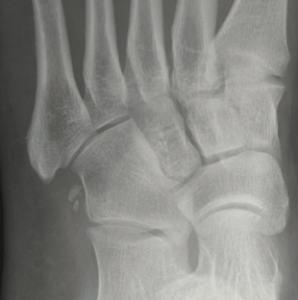 Additional associated injuries include injury to the cuboid, the os peroneum, or fifth metatarsal. (3, 13) Differential diagnoses are listed in Table 3. The os peroneum (OP) is a sesamoid bone found within the peroneus longus tendon (PLT) of most people. It is usually located just proximal to the cuboid tunnel. The OP is frequently fibrocartilaginous, often bipartite, and is only visible on x-ray 6–20% of the time (Figure 3). A history and physical examination will reveal the cause of many injuries. While the inversion movement which causes the injury occurs rapidly, the full effects may not be obvious for several hours. The lag between injury and effect will lead many patients to forget the inversion event. The history may reveal previous ankle sprain, fracture, or other lateral foot injury. Peroneal subluxation may be associated with a sensation of painful clicking. A methodical physical examination follows the principles of look, touch, and move. Examine for swelling, color, general alignment, structure, and symmetry. Thoroughly palpate the lateral foot and ankle and explore the peroneal tendons through their entire course. Peroneus brevis tears often occur behind the fibula, while peroneus longus injury may occur at the cuboid groove or more distally. Note the strength of the peroneal tendons and pain during resisted ankle eversion. Also note pain in response to dorsiflexion of the first ray or an inability to resist the dorsiflexion. 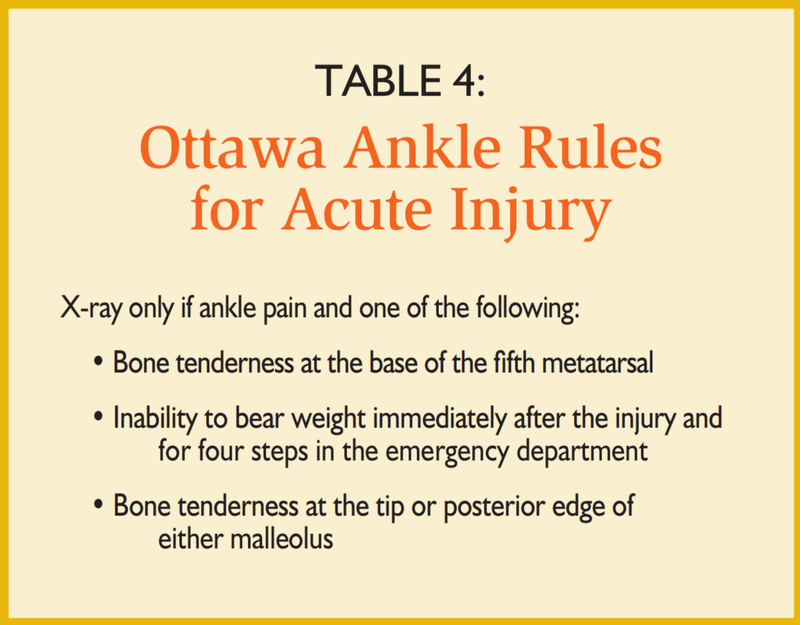 (5) Be sure to check the ankle for ligamentous disruption. 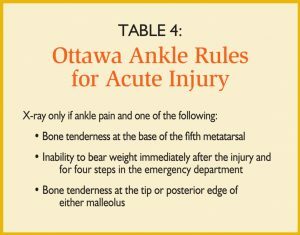 The Ottawa protocol outlined in Table 4 should only be used for acute ankle injuries and not for late injury evaluation. On x-ray, carefully evaluate all the lateral boney structures. Figure 4 shows a hairline Jones fracture that went undetected the previous night at an urgent care center (Figure 4). A visible fleck of bone at the fibula indicates possible subluxation of the peroneal tendons from the fibular groove. A Harris view assists in assessing the peroneal tubercle and the retromalleolar groove. (21, 22) Be on guard for a fracture of the os peroneum or distraction of multipartite fragments (Figure 5). Fractures of the os peroneum may best be assessed using a CT scan which better reveals the border of the ossicle. Ultrasound can be useful to detect peritendinous fluid, or partial or complete rupture, but it requires an experienced examiner. Phase I: Protection, rest, ice, compression, and elevation. Initial therapy requires protection of the injured area. 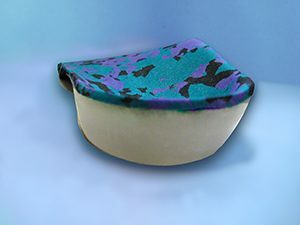 A removable pneumatic cast boot serves as both protection and compression and may be removed for exercise and evaluation. (21) An ankle brace alone is not effective since the stabilization achieved is inadequate. The tendons must be protected from forces that place them under stretch, including dorsiflexion moments applied to the foot. It is helpful to protect the mid-foot, mid-tarsal joint, and first ray from forces which translate into strain forces on the peroneal tendons. 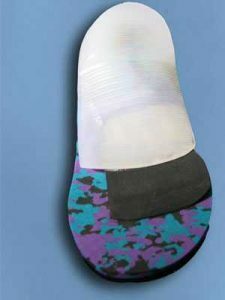 The removable cast boot is used for one to four weeks depending upon the severity of the injury. Ice may be applied for 20 minutes on/40 minutes off for three to six times per day for the first 48 hours. Ibuprofen or another NSAID may be helpful. Do not rush the patient into vigorous muscle and strength exercises. This has been part of chronically failing regimens previously used for the ankle. Gentle range of motion exercises may be performed. Proprioception, balance, and muscle strength are keys to successful recovery. The most efficacious tool to accomplish these goals is the 20” wobble board. This appears to reach optimal angular relationships at maximum excursion to train the neuro-facilitative responses needed in gait. Muscular strength exercises may be augmented using exercise band therapy. Recent evidence has shown more proximal muscle training may also assist in recovery. Limitation of dorsiflexion and equinus may be addressed by posterior muscle group stretching and active exercises such as the heel roll-up. Toe crunches strengthening the intrinsic muscles are also helpful to stabilize the mid-tarsal joint and decrease PTC forces needed for this stabilization. Gentle foam rolling of the calf muscles may help mobilize the ankle. The balance and proprioceptive exercises from Phase III should all be continued for at least three months. Specific training for a return to activity may begin. Preparation for return to full activity includes beginning with walking, progressing to running, cutting, and sideways movements needed for sport. It generally requires four to six weeks to return to most sports but occasionally twelve weeks may be needed. 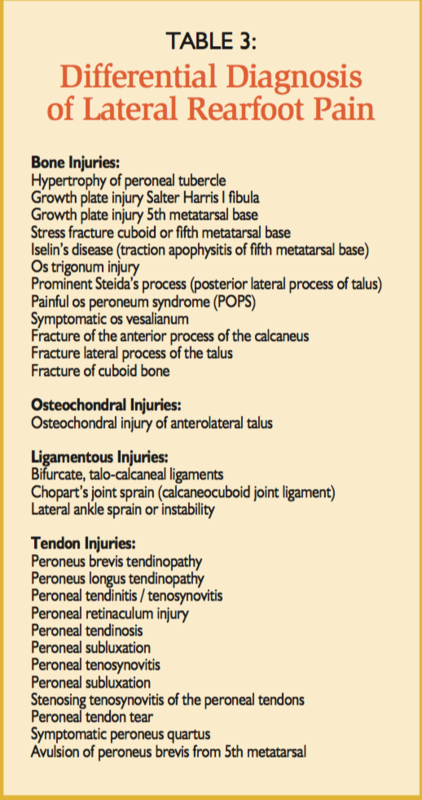 We have briefly reviewed the anatomy, injuries, and rehabilitation for injuries to the PTC (Table 7). There is much to research and write about this topic. Don’t stop learning. Your patients benefit from your knowledge. Figure 2. Normal os peroneum. Figure 4. Hairline Jones fracture. Tender to touch and visible on x-ray. Figure 5. Fragmented os peroneum. Healing bone callus visible. 1. Waterman, B.R., et al., The epidemiology of ankle sprains in the United States. J Bone Joint Surg Am, 2010. 92(13): p. 2279–84. 2. Palmanovich, E., et al., Peroneus longus tear and its relation to the peroneal tubercle: A review of the literature. MLTJ Muscles, Ligaments and Tendons Journal, 2011. 1(4): p. 153–160. 3. Brandes, C.B. and R.W. Smith, Characterization of patients with primary peroneus longus tendinopathy: a review of twenty-two cases. Foot Ankle Int, 2000. 21(6): p. 462–8. 4. Vasiljevi?, V., L. Markovi?, and J. Vasi?-Vili?, Accessory bones of the feet: Radiological analysis of frequency. Vojnosanitetski …, 2010. 5. 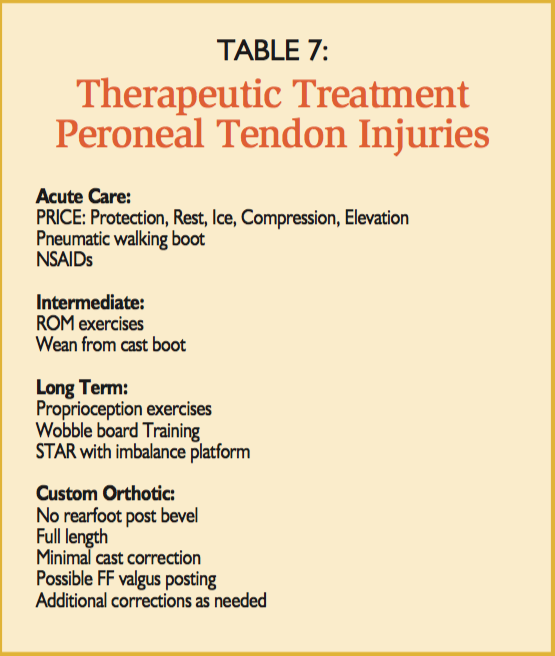 Roster, B., P. Michelier, and E. Giza, Peroneal Tendon Disorders. Clin Sports Med, 2015. 34(4): p. 625–41. 6. Perry, J., Gait Analysis: Normal and Pathological Function. 1992, SLACK, Inc.: Thorofare, NJ. p. 165–167. 7. Santilli, V., et al., Peroneus longus muscle activation pattern during gait cycle in athletes affected by functional ankle instability: a surface electromyographic study. Am J Sports Med, 2005. 33(8): p. 1183–7. 8. Terrier, R., et al., Assessment of evertor weakness in patients with chronic ankle instability: Functional versus isokinetic testing. Clin Biomech (Bristol, Avon), 2017. 41: p. 54–59. 9. DiGiovanni, B.F., et al., Associated injuries found in chronic lateral ankle instability. Foot Ankle Int, 2000. 21(10): p. 809–15. 10. Cerrato, R.A. and M.S. Myerson, Peroneal tendon tears, surgical management and its complications. Foot Ankle Clin, 2009. 14(2): p. 299–312. 11. 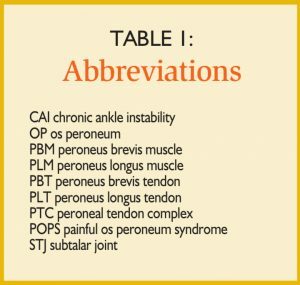 Hyer, C.F., et al., The peroneal tubercle: description, classification, and relevance to peroneus longus tendon pathology. Foot & ankle international, 2005. 26(11): p. 947–950. 12. Mook, W.R., S.G. Parekh, and J.A. Nunley, Allograft Reconstruction of Peroneal Tendons. Foot & Ankle International, 2013. 34(9): p. 1212–1220. 13. Ziai, P., et al., Peroneal tendinosis as a predisposing factor for the acute lateral ankle sprain in runners. Knee Surg Sports Traumatol Arthrosc, 2016. 24(4): p. 1175–9. 14. Burrus, M.T., et al., Predictors of peroneal pathology in Brostrom-Gould ankle ligament reconstruction for lateral ankle instability. Foot Ankle Int, 2015. 36(3): p. 268–76. 15. Gerber, J.P., et al., Persistent disability associated with ankle sprains: a prospective examination of an athletic population. Foot Ankle Int, 1998. 19(10): p. 653–60. 16. Richie, D.H. and F.E. Izadi, Return to play after an ankle sprain: guidelines for the podiatric physician. Clin Podiatr Med Surg, 2015. 32(2): p. 195–215. 17. Khor, Y.P. and K.J. Tan, The Anatomic Pattern of Injuries in Acute Inversion Ankle Sprains A Magnetic Resonance Imaging Study. 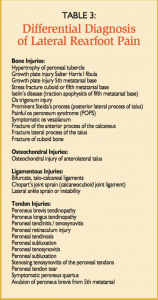 Orthopaedic journal of sports medicine, 2013. 18. Gribble, P.A., et al., 2016 consensus statement of the International Ankle Consortium: prevalence, impact and long-term consequences of lateral ankle sprains. Br J Sports Med, 2016. 50(24): p. 1493–1495. 19. Konradsen, L., et al., Seven years follow-up after ankle inversion trauma. Scand J Med Sci Sports, 2002. 12(3): p. 129–35. 20. Sobel, M., H. Pavlov, and M.J. Geppert, Painful os peroneum syndrome: a spectrum of conditions responsible for plantar lateral foot pain. Foot & ankle …, 1994. 21. Heckman, D.S., G.S. 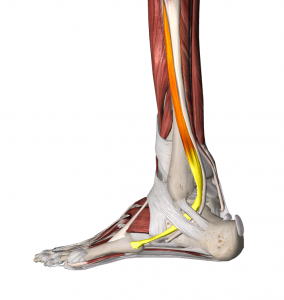 Gluck, and S.G. Parekh, Tendon disorders of the foot and ankle, part 1: peroneal tendon disorders. Am J Sports Med, 2009. 37(3): p. 614–25. 22. Bruce, D.W., et al., Stenosing Tenosynovitis and Impingement of the Peroneal Tendons Associated with Hypertrophy of the Peroneal Tubercle. Foot & Ankle International, 1999. 23. Major, N.M., C.A. Helms, and R.C. Fritz, The MR imaging appearance of longitudinal split tears of the peroneus brevis tendon. Foot & ankle …, 2000. 24. Giza, E., et al., A clinical and radiological study of peroneal tendon pathology. Foot & ankle …, 2013. 25. Park, H.J., et al., Reliability of MRI findings of peroneal tendinopathy in patients with lateral chronic ankle instability. Clin Orthop Surg, 2010. 2(4): p. 237–43. 26. Kosik, K.B., et al., Therapeutic interventions for improving self-reported function in patients with chronic ankle instability: a systematic review. Br J Sports Med, 2017. 51(2): p. 105–112. 27. Kaminski, T.W., et al., National Athletic Trainers’ Association position statement: conservative management and prevention of ankle sprains in athletes. J Athl Train, 2013. 48(4): p. 528–45. 28. De Ridder, R., et al., Effect of a Home-based Balance Training Protocol on Dynamic Postural Control in Subjects with Chronic Ankle Instability. Int J Sports Med, 2015. 36(7): p. 596–602. 29. Hupperets, M.D., E.A. Verhagen, and W. van Mechelen, The 2BFit study: is an unsupervised proprioceptive balance board training programme, given in addition to usual care, effective in preventing ankle sprain recurrences? Design of a randomized controlled trial. BMC Musculoskelet Disord, 2008. 9: p. 71. 30. Hupperets, M.D., E.A. Verhagen, and W. van Mechelen, Effect of unsupervised home based proprioceptive training on recurrences of ankle sprain: randomised controlled trial. BMJ, 2009. 339(jul09 1): p. b2684. 31. Herb, C.C. and J. Hertel, Current concepts on the pathophysiology and management of recurrent ankle sprains and chronic ankle instability. Current Physical Medicine and Rehabilitation Reports, 2014. 2(1): p. 25–34. 32. Gribble, P.A., J. Hertel, and P. Plisky, Using the Star Excursion Balance Test to assess dynamic postural-control deficits and outcomes in lower extremity injury: a literature and systematic review. J Athl Train, 2012. 47(3): p. 339–57. 33. Sesma, A.R., et al., Effect of foot orthotics on single- and double-limb dynamic balance tasks in patients with chronic ankle instability. Foot Ankle Spec, 2008. 1(6): p. 330–7. 34. 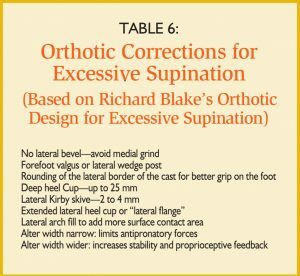 Blake, R. Orthotic Design for Excessive Supination. 2013 (cited 2017 05/05/2017); Available from: https://www.youtube.com/watch?v=hMhrTmWXfDA. Bio: Dr. Pribut is a Clinical Assistant Professor of Surgery at George Washington University Medical School. He serves on the Runner’s World Board of Advisors. 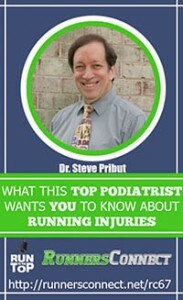 He is a past president of the American Academy of Podiatric Sports Medicine. Dr. Pribut is in private practice in Washington, DC. A new study – online at the J Applied Physiology (August 31, 2017) – was performed to measure beneficial impact on collagen production in chronic tendinopathy. The study evaluated mRNA (and ribosomal RNA) and more along with determining the impact on gene activity. The study did demonstrate that there was a decrease in pain compared to placebo and suggested that the pain reduction pathway may work in ways not yet well described. The best news was that although it may not have a dramatic impact on chronic Achilles tendinopathy (which we suspected and perhaps knew all along), it did not destroy tendon cells. Hot off the presses – a new article at Podiatry Management Magazine with CME credits available. Just added: peroneal tendon complex injury and rehabilitation. 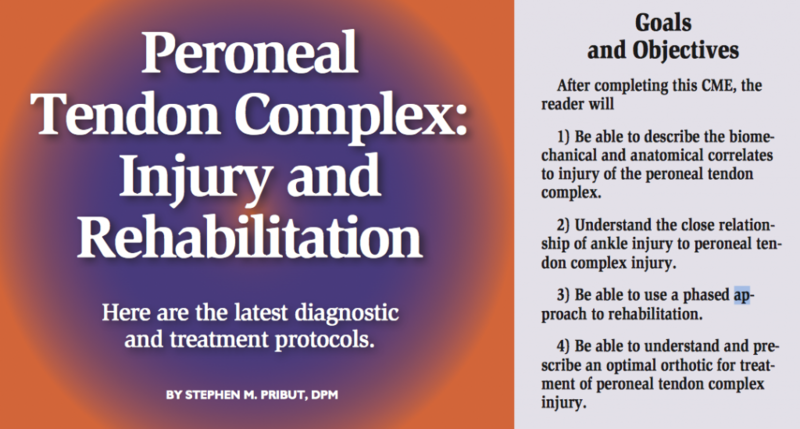 And for the pdf file for the article just published: Peroneal Tendon Complex: Injury and Rehabilitation. In most cases I am not designing a foot to correct a “foot type” but to provide a solution for a specific clinical problem. 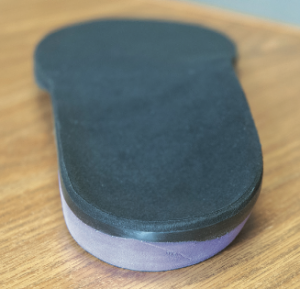 While having a high arched, over supinated, under pronated foot may predispose to certain problems other “foot types” can have many of the same problems. In many instances with problems like these, immobilization may be necessary for a time. Wobble board training should be incorporated into rehabilitative programs. The purpose of the wobble board training is to have the neuromuscular system adapt the peroneal muscles to performing repetitive firing for stabilization. The angles that the wobble board makes with the ground and the motion and angular relationships that it engenders in your ankle and leg are ideal to training the peroneals to fire appropriately. The wobble board assists in training muscle strength, balance, and improving joint position sense. There is nothing that beats this 3 in 1 training. Accurate cast of the foot. I do not want a 2D pressure scan. I want to hold the foot in neutral subtalar joint position. And I want to plantar flex the first ray by either light dorsal pressure over the first metatarsal or by slight dorsiflexion of the great toe during the casting. I want the cast to reflect the shape of the foot to mirror it so that when I want to alter forces, they will be altered by the shape and adjustments to the orthotic. I want the forces distributed through a large surface area and need conformity between the shape of the foot and the shape of the orthotic. This resists over supination directly. It is like an outrigger on a boat. It also changes moments of force going into the foot. 3 degree lateral forefoot wedge. This is often used to prevent over supination of the foot after the heel as left the ground or as weight is transferred towards the forefoot. These are often my starting steps to deal with the problems listed above when they are resistent to treatment. For a Pes Cavus, high arched, over supinated foot podiatrist Richard Blake, DPM has put a great video on line. It details his 8 steps to deal with this foot type using specially customized orthotics. 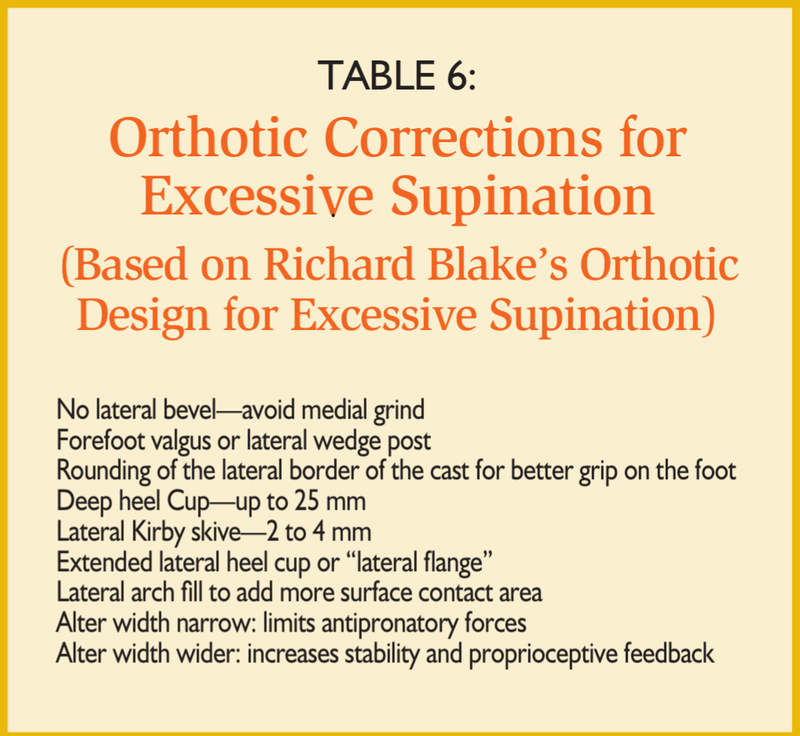 The modifications made for this problem are not found in over the counter orthotics. And many specialists do not see enough patients with high arches to be adept at treating the problems associated with this foot type. It is important to find a physician that has experience with sports medicine, high arch feet, and biomechanics. First an accurate cast is required as described above. A) Rounding of the lateral border of the cast or via CAD/CAM to have the orthotic better grip the foot. B) Lateral Kirby Skive. Often 2 to 4 mm. C) Deep Heel Cup – up to 25 mm. E) Eliminate “medial heel grind off” and/or add No Lateral Bevel in rearfoot posting instructions. This video is well worth watching for anyone who needs the modifications or anyone who is planning to incorporate them into a patient’s orthotics. Those two recommended set of injections at $6,000 per series for your Achilles tendinitis hasn’t sounded very good for the past few years. Ever since a controlled, prospective comparison study demonstrated there was absolutely no difference in the efficacy of PRP over saline injected in the same manner, there has been doubt about the use of PRP in the office. But instead of falling by the wayside, like a bad political candidate, it has spread by meme and scheme far and wide and even infiltrated some of the best offices in the country and world. The British Medical Journal has recently posted an article strongly recommending against the in office use of PRP (platelet rich plasma) outside of established studies. The article was titled: “How effective are platelet rich plasma injections in treating musculoskeletal soft tissue injuries?” The answer, at this time, seems to lie somewhere between “we have no clue” and “not very”. This study mentions a previous review by the Cochrane review (2014) which examined 19 studies and found insufficient evidence of the usefulness of PRP. This study reviews 10 additional studies and reaches the same conclusion. 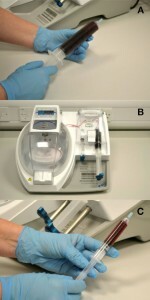 Autologous platelets have no effect on the healing of human achilles tendon ruptures: a randomized single-blind study. Schepull T1, Kvist J, Norrman H, Trinks M, Berlin G, Aspenberg P. Am J Sports Med. 2011 Jan;39(1):38-47. doi: 10.1177/0363546510383515. Epub 2010 Nov 3. I’ve found what I am sure is the best podcast on running. The podcast is put on by Runnersconnect and hosted by excellent and ever improving, elite marathoner Tina Muir. Tina is knowledgeable, ever prepared, sounds great, and conducts a wonderful interview each week. Runners Connect has interviewed many fascinating people from the running community. Among those I’ve listened to are Dan Lieberman, Chris McDougall, Tim Noakes, and Jack Daniels. Each week there is another interview with someone who has a special take on running and from which you can learn. This week a podcast in which I was interviewed has gone online. The interview covered a lot of ground. We did not review the questions in advance. Instead we did wing it. Free range always sounds best to me. Tina was well prepared and asked questions that led to many different areas. I hope you find the podcast interesting. It is likely to contain information you haven’t heard before and likely not quite what you’d expect. If what you wanted wasn’t included, there are so many other great podcasts, I have no doubt you’ll discover a good number that you’ll enjoy. Is There Really A New Exercise Which Will Cure Plantar Fasciitis? This study showed no benefit at 1 month, 6 months and one year. There was only a benefit noted at the 3 month datapoint, which then disappeared. Last fall, you may have read in the New York Times that an article had been published in the Scandinavian Journal of Medicine & Science in Sport (August 2014) discussing the benefit of high load strength training for plantar fasciitis. The NY Times then described the wonders of this “one simple exercise” in alleviating the pain of plantar fasciitis. The implication was that this particular exercise was the only thing that was going to work. 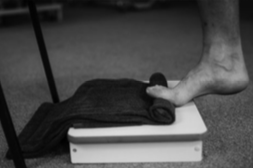 The exercise is done while standing on one foot on a box with the toes dorsiflexed on a rolled up towel. Although if you use a section of the New York Times rather than using the entire paper for your bird cage that may have equivalent effects. How Large, Precise and Lasting Was the Treatment Effect? This question is a basic question asked in the American Medical Association’s Guide to the Medical Literature, subtitled “A Manual for Evidence-Based Clinical Practice”. We don’t find the component parts of this question impressively demonstrated in this study. The main problem is that the article (Rathleff 2014) found a significant improvement ONLY at 3 months (between the group performing the one leg calf raise and those performing a stretch that I’m not fond of). Both groups used “shoe inserts”. Another problem is that was called the control group was a comparison and not a control group. We’ll continue to use their term. At 1 month, 6 months and 12 months, there were no significant differences or benefits of this exercise over the control group which just used one stretch and shoe inserts. If we found an exercise (like flossing) that made us feel better only at age 30 and gave us fewer cavities and better gums but only at age 30, there would be no benefit over other exercises that worked equally well for age 20, 40, 50, and 60. There would be no study or media attention given. But with the dearth of truly useful evidence based sports medicine the insignificant gains significance. Most would like to use a treatment that enables them feel better in 4-6 weeks and at 4 to 6 months. The 3 month data point as a single marker is not useful. They began the study with 24 in each group. There was a higher drop out number on the study group. Looking at the high-load strength training group there were n=22 measured at 1 month, n=18 at 3 months, n=17 at 6 months and n=18 at 12 months. At the 3 month and beyond time points they were below the levels pre-determined for measuring a detectable difference between groups. So here we have a study of a few people who were improved in comparison with another control group for “one brief shining moment” which quickly passed. Both groups were ultimately better after 1 year but did not demonstrate a superiority of one treatment over the other. The study design is impeccable. The statistical analysis is elegant. But, the subject number is quite low and the results are clearly open to a different interpretation. Will this exercise be helpful to some people? Yes it will. Will it be helpful to all and is there a unique benefit demonstrated by this research. No, it is not and there is no unique benefit to this exercise. There is only evidence for a briefly lasting one in this extremely small study which was seen only at the 3 month mark. Not before and not after. So the hype on this study is just that – media hype with no basis in the evidence contained in the study. DiGiovanni BF, Nawoczenski DA, Lintal ME, Moore EA, Murray JC, Wilding GE, Baumhauer JF. Tissue-specific plantar fascia-stretching exercise enhances outcomes in patients with chronic heel pain. A prospective, randomized study. J Bone Joint Surg Am 2003: 85-A: 1270–1277. Digiovanni BF, Nawoczenski DA, Malay DP, Graci PA, Williams TT, Wilding GE, Baumhauer JF. Plantar fascia-specific stretching exercise improves outcomes in patients with chronic plantar fasciitis. A prospective clinical trial with two-year follow-up. J Bone Joint Surg Am 2006: 88: 1775–1781. Lemont H, Ammirati KM, Usen N. Plantar fasciitis: a degenerative process (fasciosis) without inflammation. J Am Podiatr Med Assoc 2003: 93: 234–237. Pribut SM, “Current Approaches to the Management of Plantar Heel Pain Syndrome” J Am Podiatr Med Assoc, January 1, 2007; 97(1): 68 – 74. Pribut SM, “Challenging Running Injuries: Be Knowledgeable” Podiatry Management January 2010, 157-166. Rathleff MS et. 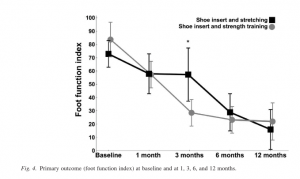 al., “High-load strength training improves outcome in patients with plantar fasciitis: A randomized controlled trial with 12-month follow-up.” Scand J Med Sci Sports. 2015 Jun;25(3):e292-300. Thomas JL et. al., “Diagnosis and Treatment of Heel Pain: A Clinical Practice Guideline-Revision 2010”, J Foot & Ankle Surgery 49(2010) S1-S19. What are laces good for? Laces help keep your shoes securely on your foot. They should apply pressure evenly and appropriately. Not too tight, not too loose. Just the way the story Goldilocks and the Three Bears would have described it. Once you have found the perfect lacing system you are sure to discover it changes before very long. 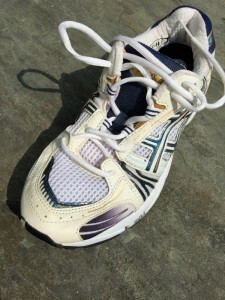 Running shoe manufacturers often change the position, orientation and spacing of the eyelets and the lacing system. One would like to believe it is an evolution to greater comfort, efficiency and fit. But appearance and marketability plays at some role. 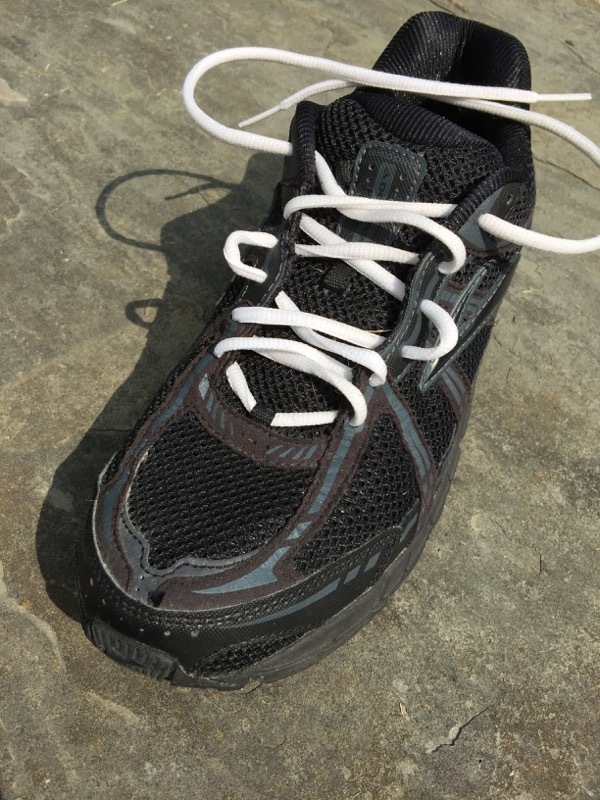 Over the past few years though, the lacing system that many manufacturers have been adopting returns to a long established standard and is much easier to modify. 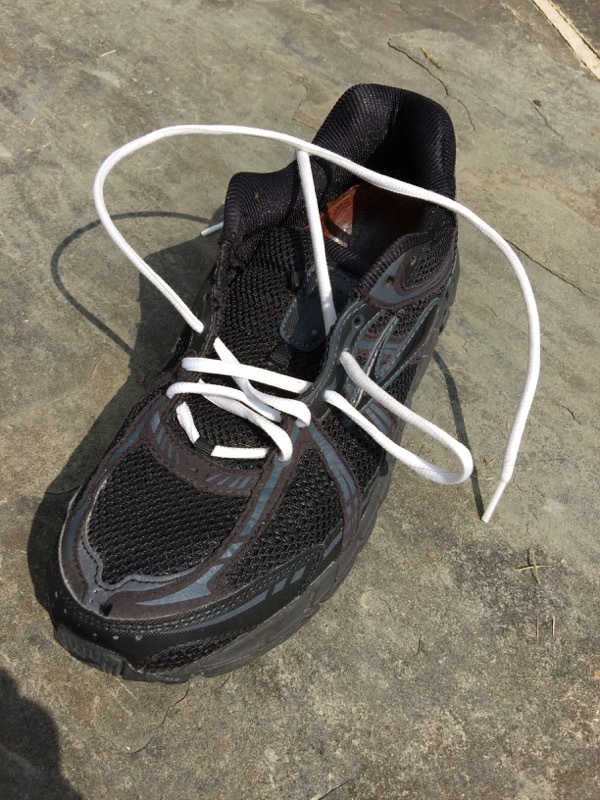 What Problems Can Laces Cause?